At the University of Cologne, GeStiK has established the Master's programme “Gender & Queer Studies” as a central inter-faculty institution and is mainly responsible for its conception. The programme is supported by all faculties of the university and realised in cooperation with the Cologne University of Technology and contributions of the Cologne University of Music and Dance. The 1-subject Master's programme offers research-oriented profiling opportunities for students from various disciplines in the broad fields of (applied) social and educational sciences, humanities and cultural sciences, natural and technical sciences, law, medicine, economics and the arts. 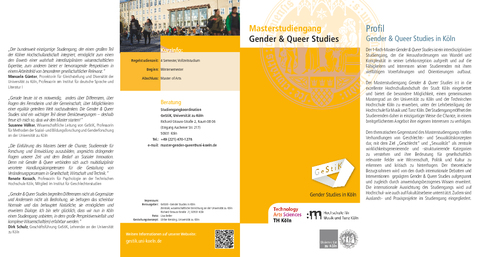 The thematic subject of the Master's programme is the negotiation of "gender" and "sexuality concepts", which are analysed from different theoretical, methodological and system-competent perspectives and thereby provide diverse, mutually complementary (inter-)disciplinary approaches. The theoretical frame of reference is stretched by international Gender Studies and Queer Studies and at the same time extended by application-oriented knowledge. Such knowledge space is unique in the German academic landscape. We are pleased about the successful accreditation of the Master's programme Gender & Queer Studies. Here you can find the radio interview (Kölncampus) with GeStiK Managing Director Dr. Dirk Schulz on the occasion of the introduction of the Master's programme Gender & Queer Studies in July 2017.